Nayland is one of the most chocolate-boxy of the Stour Valley villages, but it still has the sense of a place where, with its shops, pub, and other amenities, you could still live an independent life. The church is shoehorned into a tight site among houses which are nearly as old. 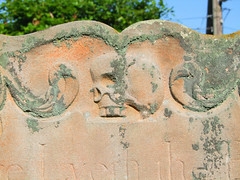 Only to the north is there room for the graveyard to expand. Because of this, you might be tempted to only see the church from this side, but this would be a mistake, for although it is grand enough with its battlemented clerestory, it is perhaps the least interesting of the four sides. 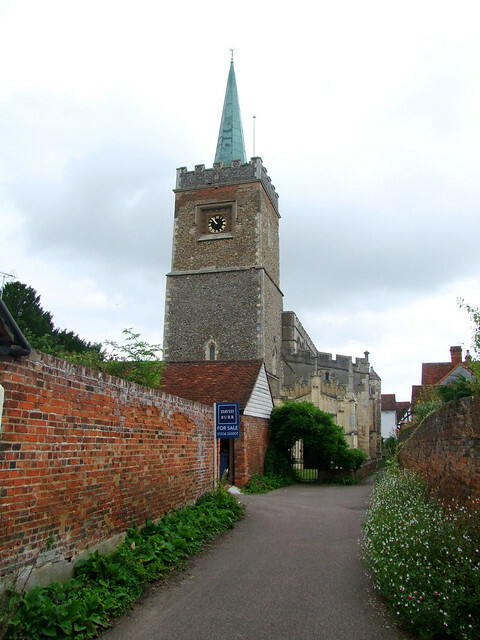 St James was a 15th century cloth church, rebuilt on the wealth of the cloth traders. You can step down into the seriously civic north porch, or continue anti-clockwise to the west tower, behind the houses, where the west door has four steps, but these go up. Most curious. The tower was never rebuilt, and so it is still the original 14th century one, and the late-medieval battlements are, in fact, Victorian. Carrying on southwards along the western face of the tower, you come to the surprise of a third entrance, and much the grandest. 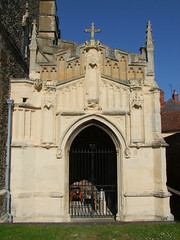 William Abell's porch was given as part of a bequest on the eve of the Reformation. 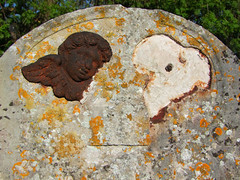 Rather curiously, it faces westwards at the end of the south aisle, and is no longer in regular use. A narrow path leads up the south side of the church, with a wall and gardens beyond. It takes us past a grand red brick rood loft stair turret, an indicator that the screen went right the way across the church as at Blythburgh, Southwold, Lowestoft St Margaret and other grand churches of the same date. 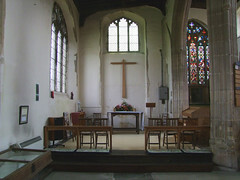 The east end of chancel and chapel, is more intimate. And then, you are back round into the open churchyard, and at last you can step in through the north porch. The first impression is of 20th Century High Church decorum, with Stations of the Cross set in the walls and a grand ritualist sanctuary. But it is not an urban triumphalism. Here, the feeling is of a rural church at ease with itself. 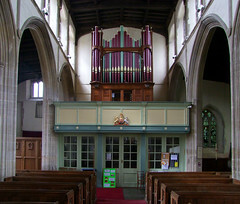 The nave is immediately reminiscent of that at Framlingham, with the organ high in its gallery, the well recut font in the north-west corner, and solid pillars leading to a bold clerestory. 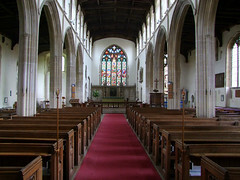 The aisles spread beyond the arcades, and end in chapels furnished in a modern style. The roof is perhaps reminiscent of that of Blythburgh in its camber, but is entirely devoid now of angels and monograms. The chancel is high and grand, and if the stone reredos is a little severe then this is adequately compensated for by John Constables best altar piece. 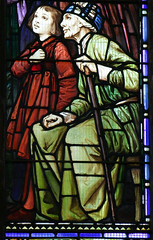 Christ blesses the bread and wine with a haunting expression on his face, and you wonder if this might have been the path that the young Constable might have taken if he hadnt achieved success as a landscape painter.He made three altar pieces for local churches: here, Brantham and Manningtree. The Manningtree altarpiece spent half a century at Feering after the church was closed and demolished, but is now on display at Dedham. All three are, of course, replicas, the originals in safe storage. 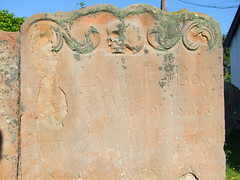 If you can get access to the vestry, you will find the memorial to William Jones, vicar for the last quarter of the 18th century. His place in modern Anglican history is secure and undeniable, and yet his name is almost entirely forgotten. 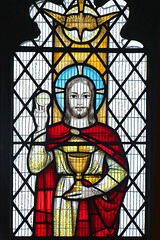 At a time when the Church of England was almost entirely the preserve of a boorish squirarchy, he led a group of intellectuals who explored the spiritual nature of the church, and attempted to reintroduce ideas to their parishioners like the real presence in the Eucharist. 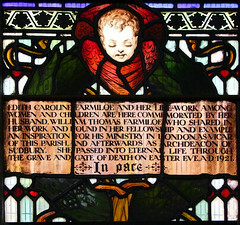 He made his mark felt in many corners of the English Church. One of his early followers was John Wesley, who founded the Methodist movement. 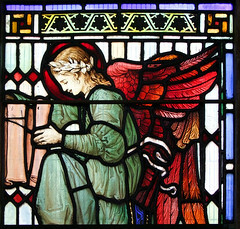 Another was the father of John Keble, who went on to be the inspiration behind the Oxford Movement. Yet another person inspired by the legacy of his spiritual writings was the young John Henry Newman. 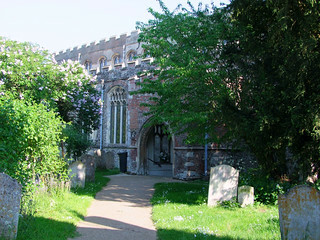 It seems incredible that the catalyst behind the two great Anglican breakaway movements of the last 250 years should have been a quiet clergyman in this Suffolk backwater, although in the late 18th and early 19th century the name 'Jones of Nayland' was well-known. 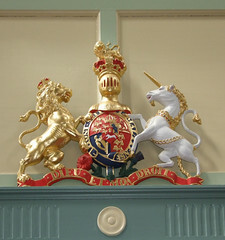 Nayland has six surviving brasses, to the Sekyn, Hacche and Davy families. 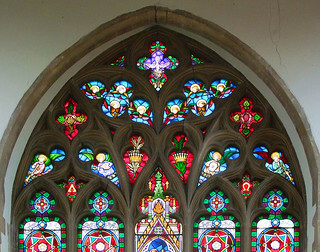 But for me, the real star of the show here is the glass in the south aisle. 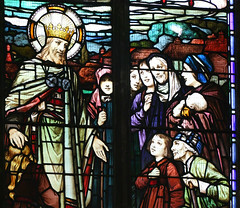 This is James Clark's remarkable window of the risen Christ greeting Nayland parishioners, shown as real portraits of people of the time. 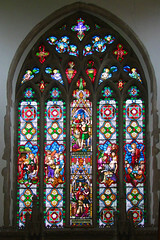 A window in the north aisle depicts parishioners of the 1960s with their parish priest Gilbert Henry Wallace Warwick. 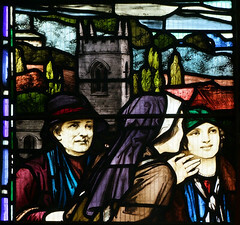 It is in the style of the York school of stained glass painters of the time, I wonder who it is by? This grand church is probably not a very high priority for anyone on the ecclesiological tourist circuit. 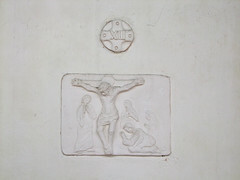 But as on the outside, there are medieval survivals inside, and the most remarkable of these are hanging up on the south aisle wall. 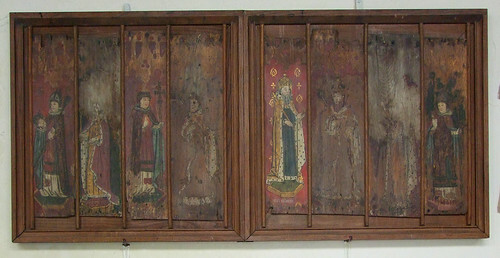 These are the panels of the medieval roodscreen (the frame and boarding is all Victorian) and show eight figures. 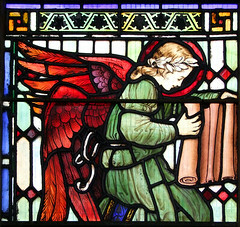 The first shows St Cuthbert - the football in his hand is in fact a head; the second and third are two popular Saints in East Anglia, our own St Edmund and the Papal St Gregory (you can tell that the furious Anglican reformers didn't like him). 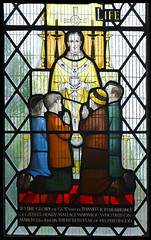 The fourth is a King, the fifth shows the legend of St Edward the Confessor, the next two are Kings, and the last is probably St Thomas of Canterbury. Suffolk's biggest funeral bier sits in the south aisle. You can't help thinking that it was designed for grand processions for civic worthies. And what processions they might have been, through these unspoilt late medieval streets in all their glory to this tremendous building! All in all, a reminder that, as late as the 19th century, Nayland was a significant place, before a second industrial revolution faded it back into obscurity.